Look chic in a cinch with two-tone dresses. Delicate neckline pleating and a vibrant purple skirt make this is a fab cocktail dress by itself. 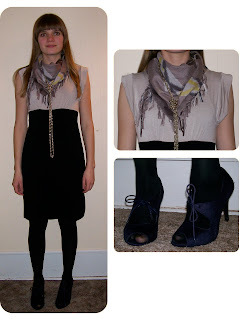 Paired with tights, booties and a cardigan, it's perfect for work. You get the look of a top tucked into a high-waisted skirt without the hassle. The simple silhouette and neutral color palette of this dress let you transform it with accessories depending on the occasion. On the Runway: Marni Fall 2008 RTW. Image source: Style.com. On the Runway: Roksanda Ilincic Fall 2008 RTW. Image source: Style.com.